hello bookish peeps! 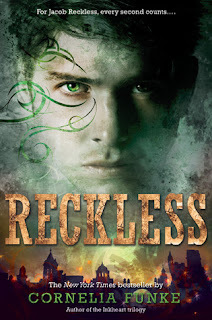 i'm thrilled to be part of the Reckless blog tour hosted by Little, Brown Publishing. Unless he can find a way to stop it. Cornelia was a total doll and took the time to answer some very pressing questions from yours truly! Lisa: I saw you wrote this book with Lionel Wigram, and that you loved it and that you'd definitely work with someone again to write a book. How did two minds help shape this story in a way that yours alone couldn't? Cornelia: I always compare it to two painters. One is painting a brilliant Yellow, the other a beautiful Blue but only together they suddenly paint Green! It was wonderful to work with a man and discuss scenes between the female and male characters, or to be enchanted by the 19th century because Lionel loves it so much. It was incredibly inspiring to not just discuss plot in my own head but with another person, fighting over plot twists and dialogue with two imaginations and voices, bringing both our lives, fears and passions to the table. I still prefer to for a few months write alone just listening to the story's voice- sometimes a dialogue can be too loud to properly listen to it- but I love to in between drafts to sit down with Lionel and discuss everything I made from our ideas and discussions, every path I found in the story's labyrinth and then together come up with ideas to make everything even richer. Lisa: Which character is your favorite, and why? Lisa: You can only read three books for the rest of your life - which three are they? Cornelia: The Once and Future King, Ovid's Metamorphosis and.....hmmm, Neil Gaiman's Neverwhere. as if the book trailer and the author interview wasn't awesome enough, Little, Brown is really bringing the awesome by giving a copy of Reckless away to one of you! thanks again to Little, Brown for sharing this book with me and for inviting me to be a part of the tour! y'all, i am a huge fan of Little, Brown and love supporting them in any way possible. MUCH LOVE. Read the first 16 chapters on NetGalley! please be sure to check out the rest of the tour! i love what they did with this cover. i saw this at the library the other day and the librarian told me they bought it at my recommendation. how awesome. now i just need to read it! also, my own mike keeps telling me i need to read gaiman's neverwhere. he tells me he KNOWS i would love it. i need to work that in soon. lovely interview. i've always been interested in how two people write together...i can't imagine how tough it would be to write ALONE (i lack that certain creative gene) but i would think that writing together would be ten times harder. she makes it sound rather cool.